60ml format in Gorilla bottle. Click here for Golden Ticket in 30ml glass bottle. Enjoy this perfectly crafted, rich, creamy, and mouth watering chocolate milk flavour by Met4. This is one of the absolute best chocolate milk flavors on the market today - we think you will agree! Tastes like a glass of PURE LOVE! Read the summary and times it by a million. There is a bit of a chemical after taste but it isn't overwhelming and doesn't take away from the chocolate milk taste much. I have to say out of the chocolate or mocha juices I have tried, this is probably the best. I would probably re-order again in the future but I don't think it will replace my go-to's (caramel or banana canolli). I definitely didn't find it to be overly sweet, definitely a good choice for those who can't handle the overly sweet juices. Usually go for the minty flavours but this makes a nice change! Jay is a 100% rigth! Taste like Baileys! Realy good and creamy vape! The greatest chocolate flavor ive ever tried, taste exactly like chocolate milk straight out the carton, the 6mg nicotine gives it a slight harshness that would probably be better with less to taste the flavor more. This one is tasty! To me it's not so much like chocolate milk, but more like Baileys with a hint of more cocoa. Review by Exactly like chocolate milk! I like this stuff but it's way too mellow. Needs a lot more chocolate and a lot less milk. Straight up chocolate n dairy. Great after dinner or with coffee. 5 stars! Really sweet and creamy. This stuff tastes so much like chocolate milk that it often reminds me of some specific carton of chocolate milk on some specific day in my childhood. Like, different specific days and different specific cartons of chocolate milk, following me around town like a little flock of deja-vu's. Most excellent. This has that weird JellyBelly thing going on where it actually tastes eeirly similar to chocolate milk. Whatever, stopped me from smoking! best chocolate flavour ive ever had!!!!! doesn’t taste chalky like others ive tried. This ejuice is delicious! It has a nice aftertaste of the chocolate. I will definitely order it again! My order arrived very quickly. Very happy with my purchase. So so so so happy you’re carrying it in 60ml now! My life is complete! it's hard to replicate dairy, but this one nails it! most "milky" flavours that you get can't replicate dairy very well, but this one hits the nail on the head. i've had 2 chocolate milk flavours before and they taste more like chocolate milk powder than anything else but this one is awesome! the rep over the phone told me to mix it in with heavy menthol and that it'll taste like mint chocolate ice cream and they weren't kidding. AWESOME! i can't recommend it enough. golden ticket and heavy menthol. try it out!!! I picked up a 60mL bottle of Golden Ticket, and although I've had some not so great experiences with chocolate flavours in the past, I found that it was actually a really nice, smooth, subtle chocolate flavour. 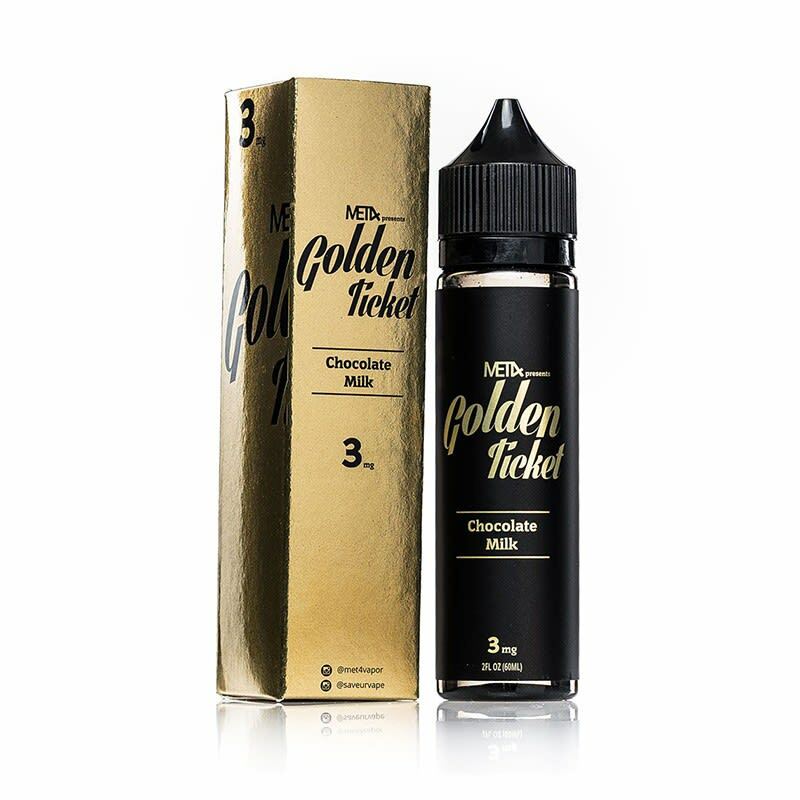 A lot of chocolate vapes end up tasting chalky like hot chocolate powder, but Golden Ticket has enough of a dairy undertone to make it a creamy milk chocolate vape. 5/5 would definitely buy again.